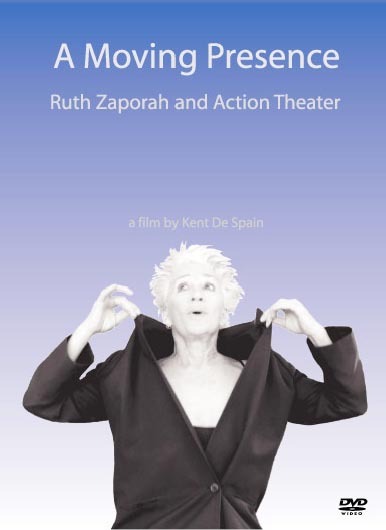 For the very first time on DVD, A Moving Presence offers a glimpse into the entertaining and challenging improvisational world of Action Theater™ and the spirit and wisdom of its founder, Ruth Zaporah. Find out why Zaporah is internationally recognized as a master teacher and performer as the film follows sixteen people through a two-week workshop in New Mexico. Watch how Action Theater™ pushes improvisers to the edge of their creativity. Actors have to move. Dancers have to talk. Complete worlds appear and disappear in the blink of an eye, and yet are somehow linked together in a narrative of vulnerability and dedication that never fails to foreground the people over the process. "[A Moving Presence] offers a...flexible program capable of introducing actors to a process-based mode of honing skills....The moving images in this film relay the dynamics of training, the sweat, the failure and the modest breakthroughs. that occur...more closely approximating the in-class environment than any acting manual...Zaporah’s improvisational techniques may be rigorous, but [the DVD] comes with a seasoned professional, Zaporah herself..."
Action Theater™ is an improvisational physical theater training and performance method (created by Ruth Zaporah) that incorporates movement, vocalization, and speech in a disciplined exploration of embodied exercises that leads to strong, clear, spontaneous, and artful improvisations. The exercises of Action Theater™ isolate the components of action – time, space, shape, energy – so they can be examined, experienced, and altered in order to expand the expressive palette. Action Theater™ is also a performance method where the experiencing of the body informs the content of the moment and offers a map, a way to proceed through the spontaneous action of solo or group improvisations. Ruth Zaporah is a New Mexico-based performance artist, director, and teacher. She is internationally known for her innovative work in the field of physical theater improvisation. She spends much of her time on tour, performing and leading trainings in Europe, Israel, Australia, Asia, and the US, and is currently a Cultural Envoy for the U.S. State Department. Ruth’s articles on improvisation have been published in Contact Quarterly, and her book, Action Theater: The Improvisation of Presence, is in its fifth printing. Who is Kent De Spain? Kent De Spain (director, editor, and cinematographer for A Moving Presence) is recognized for his work as both a dance/multimedia artist and a researcher on the process of movement improvisation. He has published several articles in Contact Quarterly, has an essay in the book, Taken by Surprise, and will be publishing a new book on improvisation through Wesleyan University Press in 2009.